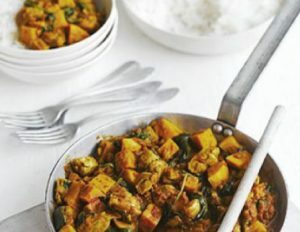 Celebrate National Curry Week by creating a curry from scratch. 1. Heat the oil in a pan, add the onion and cook over a low heat for about 5 mins until softened. 2. Increase the heat slightly, add the chicken pieces and brown. 3. Stir in the curry paste and garlic, cooking for 2 mins before adding 100ml water, the sweet potatoes and chopped tomatoes. 4. Simmer for 20-30 mins until the chicken is cooked through and the sweet potato is tender – add a splash more water if it starts to look dry. 5. Season to taste and add the spinach, removing the pan from the heat and stirring until the spinach has wilted.